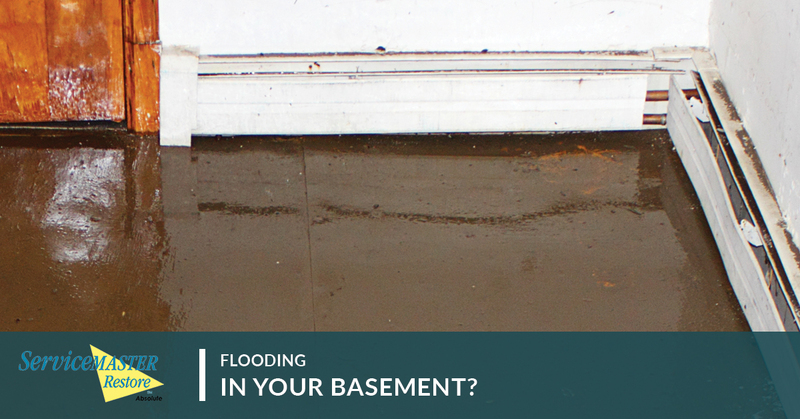 Whether it’s a burst pipe or storm damage that got into the house, you might be dealing with a flooded basement! When that water begins to collect, it’s time to contact the professionals who can help. We at SM Absolute are happy to serve San Diego and surrounding areas when it comes to water damage restoration and repair. Our team of professionals knows exactly what to do when it comes to getting rid of standing water and flood damage, and we also know what to look for when it comes to finding the first signs of mold. Don’t let your basement become even more of a disaster zone than it already is. Give our team a call! There are usually two main causes behind water damage in your basement. The first is through stormwater that has seeped in through the walls, floors, or windows of your home. This happens when there is inadequate drainage or grading around your home. Also, if you rely on a sump pump that isn’t functioning property, it may lead to basement flooding. Gutters and foundation drains can also cause problems, and unfortunately, these are your responsibility as the owner of the property. The second typical cause of basement flooding is through sanitary sewer backups from your basement drain. These backups can happen as a result of several problems, but they are most typical in older areas during wet weather. Usually, the problem occurs when ground or rain water goes into the sewer system through cracks in either city or home sewer pipes, or from old roof and foundation drain connections. These problems aside, sometimes a sewer blockage from debris or grease can lead to poor pipe conditions. Keep these things in mind before your basement floods. You may be able to avoid flooding by taking the necessary precautions and learning what you can about your property before any major storms arrive in San Diego. If your home was built long ago, make sure your downspouts are no longer connected to a sanitary sewer. Take a close look at your home’s drainage system to ensure everything is working properly. Keeping your gutters clear of debris is a great way to prevent too much water from leaking into your home. In order to prevent sewer blockages, make sure to avoid pouring grease and other thick liquids down your sinks and other drains. Also, avoid flushing items that are not meant to be flushed. Check with your insurance company to see that you have flood and sewer backup coverage. This is especially important for those of your with a finished basement. Before you buy or rent a home, check to see if it is part of a floodplain or is in a flood prone area. Homes with lower elevation or depressed driveways are more likely to have issues with flooding. At SM Absolute, we know how hard it can be to deal with flooding in your home. That’s why we encourage you to contact our team today. We look forward to helping you get rid of all the damage in your basement and get it back to the way it was before. Call now to learn more about our services and what we can do for you.